FSX – San Diego Tour Mission. Very simple mission. Beginner level. Take off from KSAN (San Diego). Fly a visitor to the MLB stadium. Fly visitor to the Resort Head back and land at KSAN. Taxi to Point of Interest. FSX – Key West Hurricane Mission Relief. Fly to the waypoint and drop some supplies. Beginner Mission and very easy. Start take off. Once you take off your first way point will be shown. Fly there drop your supplies (shift d). Return and land. 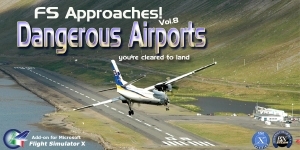 Simulator with these custom adventures updated for FSX/FSX-SE. FSX – Maneuvers Mission. Uses default C172. Complete the run and there should be 4 rewards. This missions was made with the help of Jim Keir’s FS Mission Editor. FSX – Louisiana Sea Plane Mission. Your plane for this job is a deHaviland sea plane. Fly from Lake Pontchartrain in New Orleans near Lakefront Airport. Fly south about 50 miles until you see the green marker and the Cargo Ship. Land there to drop off some supplies. Return to Lake Pontchartrain water landing near Lakefront airport. The plane for this mission is the DeHavilland Beaver DHC2. FSX – Bogota Columbia Mission. You are a pharmaceutical rep that has been making regular trips into Bogota, Columbia. You have just gotten a tip that some Colombian drug lords are out to get you. Your only chance is to take a chartered cessna to a nearby landing strip and hope that you can hide out and buy yourself enough time to get out of this situation. Fly from SKBO to SKMA.